Yesterday was an eventful day, not only for the US as a whole, but also for the inflight connectivity sector when both ViaSat and GEE announced their quarterly results at the same time. We’ve all been waiting for Southwest Airlines to make a decision about their future connectivity choices, so when ViaSat announced that “Subsequent to the end of the second quarter of fiscal year 2017 (i.e. since September 30), ViaSat was selected by a North American airline to retrofit more than 500 aircraft from its existing, mainline domestic fleet with ViaSat’s highly advanced in-flight internet system” it was natural to assume that this was Southwest. 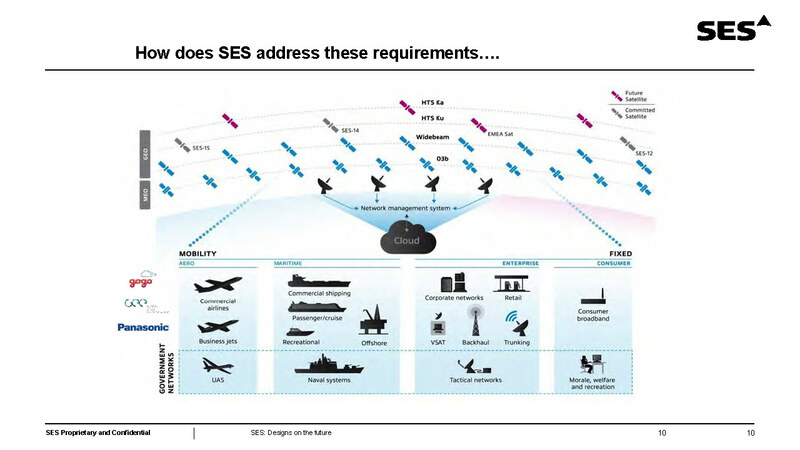 Coming after Inmarsat and Rockwell Collins’ recent win of Norwegian Airlines for GX, which is GEE’s second biggest connectivity customer, this would also have helped to explain GEE’s announcement of a Chinese investment and joint venture which will serve over 320 planes in China. What this doesn’t say is that GEE is likely to retain anything like its current business with Southwest, indeed this statement is eerily reminiscent of Gogo’s assertion in February that it hoped to “retain a strong and lasting relationship” with American, when American ultimately split its orders between Gogo and ViaSat. And a conclusion to the Southwest competition appears imminent, with either Panasonic or ViaSat expected to capture a major share of Southwest’s fleet. Panasonic certainly think they are still in the game, but others (not just ViaSat itself) appear to believe ViaSat is now in the lead on the back of aggressive terminal pricing. So what did ViaSat actually announce? Most have assumed that if it wasn’t Southwest, it must be the outstanding mainline aircraft at American Airlines, which American has the option to move away from Gogo’s ATG service. But those orders were expected to be decided in two separate batches and not necessarily in the immediate future, since American has still not even received the first installations for either of the existing contracts with Gogo 2Ku and ViaSat. UPDATE: So its a big surprise that American has now confirmed that it will be moving essentially all of its mainline fleet to ViaSat (other than the pending 2Ku installations). I had wondered if the order might instead be for upgrades at United (where ViaSat already serves 360 planes) combined with United’s rumored pending order for 100-120 new planes. And that might very well still be another win for ViaSat in the next month or two. FURTHER UPDATE: Back in late May, Gogo signed a term sheet with American Airlines which specified that its “terms will form the basis for transition to a new unified agreement to be negotiated in an effort to sign no later than October 1st, 2016.” Curiously, Gogo’s Q3 10-Q filed on November 3, makes no mention of a new agreement being signed with American Airlines either before or after the end of the quarter, which raises the question of exactly what is the status of this relationship right now, and whether the companies were unable to finalize the agreement because American decided to move the remaining mainline aircraft off Gogo’s ATG network without making any further commitment to 2Ku. However, we may not get much clarity on this issue for some time, perhaps not until Gogo’s Q4 report at the end of February. Sorry I jumped the gun on Southwest, but things still look bad for GEE, and may in fact be even better for ViaSat than I expected if they win both American and much of Southwest’s fleet, not to mention another possible win for 100+ new planes and 360 upgrades at United. After Microsoft tested Globalstar’s proposed TLPS solution (which incidentally may have been administered the coup de grace by Trump’s win last night) and claimed a “profound negative impact,” it would not be in the least surprising if they now propose that the FCC should commence a rulemaking on where these ATG ground stations should be located (presumably not in the vicinity of Xboxes! ), similar to the work on LTE-U (which also complies with existing FCC rules for unlicensed spectrum). While those rules would not necessarily prevent deployment (ATG ground stations would simply be located in rural areas away from other buildings), any rulemaking could result in delays of 1-2 years before the network can be deployed. The consequence of that would potentially be to accelerate the migration of mainline commercial aircraft away from ATG and towards satellite solutions, in order to free up more capacity on Gogo’s network for smaller aircraft and business jets. Overall, my concerns about continued ruinous competition in the inflight connectivity market have now been amplified further. Inmarsat has achieved key wins with Norwegian and IAG, which have put it firmly back in the game. ViaSat continues to grow its market share and now GEE’s refocusing on China and new investment from ShareCo could allow it to continue to compete in some international markets as well. Thales may be able to take JetBlue away from ViaSat (as Inmarsat suggested at its Capital Markets Day last month) and move these aircraft onto AMC-15/16 and ultimately SES-17. And Gogo and Panasonic still have a massive backlog of orders to work through. So despite all the talk of potential consolidation, it looks like airlines (and hopefully passengers) will continue to benefit from terminal subsidies, lower wholesale session costs and increasing bandwidth for some time to come. Its been interesting to hear the feedback on my new ViaSat profile that I published last weekend, especially with regard to ViaSat’s supposed technical advantages over the HTS competition. As I noted in the report, ViaSat has apparently been struggling with its beamhopping technology, reducing the capacity of its upcoming ViaSat-2 satellite from an originally planned 350Gbps (i.e. 2.5 times the capacity of ViaSat-1) to around 300Gbps at the moment. However, even that reduced target may require extra spectrum to achieve, with ViaSat asking the FCC in late May for permission to use 600MHz of additional spectrum in the LMDS band. Fundamentally this appears to be due to the reduced efficiency that ViaSat now expects to achieve relative to that set out in its original beamhopping patent. The patent suggested that for a ViaSat-2 design (with only 1.5GHz of spectrum, rather than the 2.1GHz ViaSat now intends to use), the efficiency could be as high as 3bps/Hz on the forward link (i.e. 225Gbps) and 1.8bps/Hz on the return link (i.e. 135Gbps) for a total of 360Gbps of capacity. But at Satellite 2016, ViaSat’s CEO indicated that an efficiency (apparently averaged between the forward and return links) of only 1.5bps/Hz should be expected, no better than existing HTS Ka-band satellites and nearly 40% lower than ViaSat originally estimated. A notable side-effect of this additional spectrum utilization (even assuming approval is granted by the FCC) is that new terminals will be required, including replacement of both the antenna and the modem for aircraft that want to make use of the extended coverage of ViaSat-2. That’s why American Airlines is waiting until the second half of 2017 for this new terminal to be developed, before it starts to install ViaSat’s connectivity on new aircraft. While the FCC’s Spectrum Frontiers Order yesterday does contemplate continued use of the LMDS band for satellite gateways (though utilization by user terminals appears more difficult), it looks like other Ka-band providers intend to shift more of their future gateway operations up to the Q/V-band, rather than building hundreds of Ka-band gateways as ViaSat will need for its ViaSat-3 satellite. That decision could reduce the costs of competing ground segment deployments substantially, while retaining continuity for user links. Thus, as a result of the lower than expected beamhopping efficiency, it remains to be seen whether ViaSat’s technology will now be meaningfully superior to that of competitors, notably SES and Inmarsat who both appear poised to invest heavily in Ka-band. 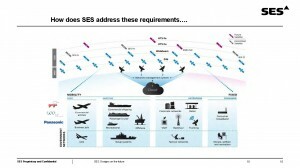 SES gave a presentation at the Global Connected Aircraft Summit last month, depicting its plans to build three new Ka-band HTS satellites for global coverage as shown above, and the first of these satellites could be ordered very shortly, because as SES pointed out in its recent Investor Day presentation, it has EUR120M of uncommitted capex this year and nearly EUR1.5B available in the period through 2020. Meanwhile Inmarsat is hard at work designing a three satellite Inmarsat-7 Ka-band system, with in excess of 100Gbps of capacity per satellite. Although the results of the Brexit referendum may complicate its efforts, Inmarsat is hoping to secure a substantial European Commission investment later this year, which would replace the four proposed Ka-band satellites that Eutelsat had previously contemplated building using Juncker fund money. So now it appears we face (at least) a three way fight for the global Ka-band market, with deep-pocketed rivals sensing that ViaSat may not have all the technological advantages it had expected and Hughes poised to secure at least a 6 month (and possibly as much as a 9-12 month) lead to market for Jupiter-2 compared to ViaSat-2. Victory for ViaSat is far from certain, and perhaps even doubtful, but beyond 2020 Ka-band therefore appears very likely to be the dominant source of GEO HTS capacity. As I predicted back in January, American Airlines has now selected ViaSat over Gogo to equip its next batch of 200 new 737 aircraft. However, Gogo rejected American’s notification that “ViaSat offers an in-flight connectivity system that materially improves on Gogo’s air-to-ground system” which led American to file a petition for declaratory judgment to enforce its rights under the contract with Gogo. With respect to each of the Fleet Types, if at any time after the [***] of the Trigger Date for such Fleet Type (A) an in-flight connectivity services provider other than Aircell offers a connectivity service (B) that provides a material improvement in connectivity functionality [***] (C) such that American reasonably believes that failing to offer such service to passengers on such Fleet Type would likely cause competitive harm to American by [***], (D) such competitive system is installed and in commercial operation on [***], and (E) American has completed sourcing processes with respect to the competitive offering sufficiently rigorous such that American can validate the technology, functionality and feasibility of the competitive offering and provide objective system performance and functionality criteria to Aircell for its use in determining whether it wishes to submit a proposal as contemplated below, then American may provide written notice thereof (including such criteria) to Aircell. In such event, Aircell will have the opportunity to submit a proposal to provide such service to American, which proposal will include, without limitation, proposed terms regarding pricing, system functionality and implementation dates, within [***] after receipt of such notice, and if Aircell timely submits such proposal then American will in good faith consider such proposal. If American reasonably determines that Aircell’s proposal is at least as favorable as the competitor’s offering, this Agreement will be amended to incorporate such additional or replacement offering or functionality and the agreed upon terms. If Aircell declines or fails to submit a proposal to American within such [***], or if American reasonably determines that Aircell’s proposal is not as favorable as the competitor’s offering, then American may elect to termination this Agreement with respect to such Fleet Type. Such election must be made by providing at least [***] advance notice thereof to Gogo, and in such event this Agreement will terminate as and to the extent and otherwise in accordance with American’s termination notice. Notwithstanding anything to the contrary contained herein, American shall not be required to provide to Aircell any information that American may not disclose pursuant to confidentiality obligations to any third party. It seems that Gogo could only have based its rejection of American’s notice on an assertion that either ViaSat’s service is not a “material improvement” (over basic ATG!) or that it is not in “commercial operation” but neither rationale appears likely to hold up in court. Moreover, the competition to equip American’s next gen 737 fleet has been going on for the last six months or more and Gogo has already offered 2Ku to American in this competition. In fact, according to Runway Girl Network, American told Gogo some time ago to stop working on the STCs needed to install 2Ku on American’s new planes. UPDATE (2/18): According to Runway Girl Network (although not specified in Gogo’s public filings), the suit “covers approximately 200 of the carrier’s 737 aircraft known as the ‘pre-Apollo’ fleet”, which are older aircraft (delivered before 2009) “flying with ATG today and no in-seat IFE screens.” A key difference between these older aircraft and American’s decision to desire to use ViaSat on future deliveries, is that Clause 13.5.2 references a different “Trigger Date” for each “Fleet Type” and so it seems likely that the time period, after which a termination notice can be issued for the new aircraft deliveries, has not yet expired, and American may therefore not have the right to terminate the Agreement in respect of its new aircraft fleet at this point in time. Conversely, American certainly has the right to terminate the older aircraft even though for some of them, with limited remaining lifespan, it may not be economic to retrofit with satellite communications. So I’m forced to conclude that in reality, Gogo is simply trying to delay American’s decision to select ViaSat for future aircraft, probably threatening litigation as it initiated (and lost) against Southwest when it purchased AirTran and switched that fleet of Gogo-equipped aircraft to Global Eagle (Delta ultimately purchased 88 of the 128 aircraft which remained on Gogo). And in response, American seems to have decided that it would go nuclear by issuing a termination notice on older aircraft, and a public lawsuit, in order to force Gogo’s hand. However, Gogo made a further filing on Tuesday Feb 17, stating that it had rescinded its prior letter which had questioned American’s termination notice (on the grounds of “system performance and functionality of the competitive technology”), and claimed that as a result American’s suit was now “moot,” presumably in an effort to limit the public airing of the two companies’ disagreements. American will have the right to terminate this Agreement at any time on or after the [***] of the Trigger Date for the last retrofitted Fleet Type, by giving [***] written notice and paying Aircell an amount equal to the amount obtained by multiplying (A) [***] by (B) Aircell’s [***] from Connectivity Revenues earned by Aircell in the year ending on the applicable anniversary of the Trigger Date. Gogo has declared that it now plans “to submit a competing proposal to install our latest satellite technology – 2Ku – on this fleet”. However, given that American has already considered 2Ku with regard to “system functionality and implementation dates” for its newer aircraft, Gogo’s only option to improve its offer would be to reduce the pricing significantly. As I’ve noted in conference presentations, ViaSat is providing significantly better service, to 4-5 times more passengers, with a revenue per boarded passenger of around $0.50, compared to the $0.80 that Gogo currently generates from its ATG network. In other words, ViaSat’s revenue per Mbyte is something like a factor of 10 lower than Gogo generates at present (and remember Gogo has told investors that the cost of capacity for 2Ku is similar to ATG-4, albeit with future reductions expected as Ku HTS satellite capacity becomes cheaper). It therefore seems that Gogo will lose either way: it either loses American’s old and/or new aircraft, setting the scene for a complete termination of the existing contract if ViaSat proves to offer a significantly superior service, or it wins the deal by offering dramatically lower pricing, which will reduce its revenue per boarded passenger and increase its capacity costs on these new aircraft, and would presumably provide a benchmark for a renegotiation of the deal covering the rest of the American fleet. That would be a far different trajectory from the increases to as much as $4-$5 per boarded passenger that Gogo set out as its long term objective in previous analyst days. However, it remains to be seen how and whether American will ultimately be able to proceed with its original plan to install ViaSat on new aircraft deliveries, or whether we are set for a long and ugly stalemate between American and Gogo over how these aircraft will be equipped.